What's Up? The Space Place: An Active Moon? Research based on high resolution lunar images obtained by the Lunar Reconnaissance Orbiter (LRO) has discovered strong evidence that indicate the Moon is still active geologically. As related by NASA, "the moon's crust is being stretched, forming minute valleys in a few small areas on the lunar surface. Scientists propose this geologic activity occurred less than 50 million years ago, which is considered recent compared to the moon's age of more than 4.5 billion years." What the researchers found was described as follows, "the LRO images show small, narrow trenches typically much longer than they are wide. This indicates the lunar crust is being pulled apart at these locations. 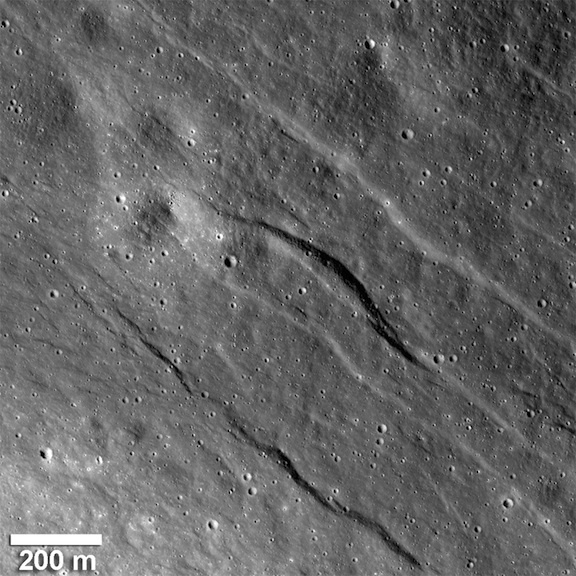 These linear valleys, known as graben, form when the moon's crust stretches, breaks and drops down along two bounding faults. A handful of these graben systems have been found across the lunar surface." Lunar scientists think that the Moon is in a state of cooling of a still hot interior. They estimate that the Moon has shrunk 300 feet from the center to the surface. The graben were found in the highlands of the far side. Researchers plan on looking for more graben and evidence of an active Moon.